In the 1979 cult classic film Breaking Away a small town American boy becomes obsessed with all things Italian: food, language, and especially bicycle racing. His father protests his rebellion saying, "I know "I-tee" food when I hear it! It's all them "eenie" foods... zucchini... and linguine... and fettuccine. I want some American food, dammit! I want French fries!" Maybe he wouldn't complain as loud if he had exposure to Italian avant-jazz. 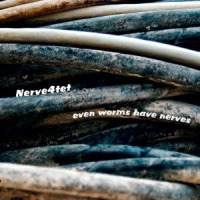 A great place for him to start might be this debut of Nerve 4tet's Even Worms Have Nerves a creative piano-less ensemble that would be equally welcome in Brooklyn, Amsterdam, and Milano. Its members have the bona fides. Baritone saxophonist Luca Tommaso Mai leads the Pain Killer/Naked City inspired band Psychofagist, plays in the noise/math/rock band Zu, and has recorded with Mats Gustafsson. Tenor saxophonist Stefano Ferrian also plays in Psychofagist and is a member of Rara Avis with Ken Vandermark and bassist Luca Pissavini. Drummer Cristano Calcagnile has recorded with Anthony Braxton's Quartet, participated in a Butch Morris conduction, and plays in Berserk with Gianluca Petrella and Eivind Aarset. The disc opens with "Broken Synapses" a loose-fitting, almost slushy, baritone and tenor conversation that bends itself into a slow blues as bass and drums enter. Mai and Ferrian are content to deliver drunken passages. They lay down heavy percussion on "Motor" baritone mimicking Calcagnile's drums before their punk esthetic is revealed. Free blowing informs their saxophones and ignites some savage bowing by Pissavini. The unique feature of the quartet is their ability to switch between noisy passages and understated improvisation. The best illustration of this is the track "Amacrine Cells" that begins with softly bowed bass and a sustained tenor saxophone note that begins to circle the bass until a cascade of metal objects are hit as chimes and the music takes off vertically. The composition moves through several peaks and valleys, tying itself together as in a complete short story. With these Italians, there is no language barrier. Track Listing: Broken Synapses; Radiata; Earthworms Nerve Chords; Motor Neuron; Amacrine Cells; Protocerebrum; Universal Computation. Personnel: Luca T Mai: baritone saxophone; Stefano Ferrian: tenor saxophone; Luca Pissavini: double bass; Cristiano Calcagnile: drums. t.